Robert H. Hinckley was born in Fillmore, Utah, on June 8, 1891. His parents were Edwin S. Hinckley and Addie Henry Hinckley. His father, Edwin Smith Hinckley, graduated with the Brigham Young Academy High School Normal Class of 1891 on May 21, 1891. He then graduated with the BY Academy Collegiate Class of 1897, receiving the degree of Bachelor of Didactics (B. D.) on May 27, 1897. Edwin Smith Hinckley became a member of the BYA faculty as Professor of Geology and Education from 1895 to 1915. During that time, he served as the Sixth Principal of BY High School from 1904 to 1909. It was in this atmosphere of education that Robert H. Hinckley grew up and was educated. He received his early education at the Brigham Young University Training School. Robert graduated from Brigham Young High School in 1910. He then he served as a missionary in Germany for the Church of Jesus Christ of Latter-day Saints. He completed his college work at Brigham Young University in 1916, earning a B.A. degree. On June 23, 1915, Robert Hinckley married Abrelia Clarissa Seely, daughter of John H. and Margaret Peel Seely. After graduating from BYU, he and Mrs. Hinckley moved to Mount Pleasant, Utah, where Mr. Hinckley became a member of the North Sanpete High School faculty. In the same year he established the Seely-Hinckley Automobile Company in Mount Pleasant. In 1918, Mr. Hinckley was elected to the Utah State Legislature from Sanpete County, and in 1923 he was elected mayor of Mount Pleasant. In 1927, Hinckley moved his family to Ogden, Utah and established an automobile business there. He became active in business, civic, and state affairs. 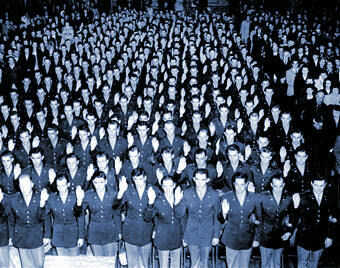 He helped organize, and became an officer of the Utah-Pacific Airways, Inc. The Utah-Pacific Airways company survived the pioneering stages of aviation with a perfect safety record. It carried thousands of passengers and taught hundreds of students to fly during the ten years Mr. Hinckley was associated with the company. It was the first flying service to furnish airplanes to the government for the purpose of taking a game census in Yellowstone National Park. Utah-Pacific Airways demonstrated that it was possible to count moose, elk, mountain sheep, etc., by airplane. This became a common practice as did the technique of dropping supplies to forest-fire fighters by small parachutes, also developed by Utah-Pacific Airways. Robert H. Hinckley's enthusiasm for flying developed early. He attended his first International Air Meet at Belmont Park, New York, in 1910. Three years later at Templehofer Field, Berlin, Germany, he made his first flight with Melli Beese, the champion woman flier of the world at that time, and wife of the French airman Charles Boutard. Years later, in 1927, he was one of the first revenue passengers to fly between Salt Lake City and Reno on a Boeing Air Transport plane. He became one of the most frequent users of commercial airplanes while serving as regional director of the Western Region for the Works Progress Administration. He played an important role in the development of airports under the WPA program. When the federal government set up its emergency relief program in 1933, Robert H. Hinckley had already served on Governor George H. Dern's Voluntary Relief Committee from 1931. He had also been appointed in 1933 by Utah Governor Henry H. Blood as director of the state emergency relief program enacted by a special session of the legislature of that year. The responsibility of supervising the expenditure of relief funds allocated by their respective state governments, as well as large sums of money provided by the federal government, fell on the state directors. Within a few months after Mr. Hinckley took the job of distributing federal funds, the success of his administration attracted attention in Washington, D.C. 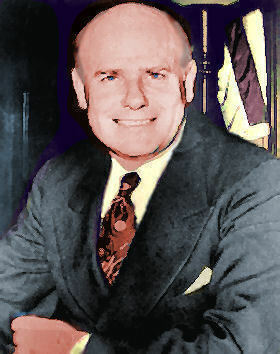 In September 1934, Hinckley was appointed by Harry L. Hopkins to serve as assistant administrator of the Federal Emergency Relief Administration, and he continued as field representative for eleven western states, and Hawaii and Alaska, a position in which he served until 1938. His work in these state and national relief programs launched a long career of government service. It was because of this background of successful administration, and his outstanding contribution to the development of airports and airways, that Robert H. Hinckley was nominated by President Franklin D. Roosevelt to become a member of the Civil Aeronautics Authority in 1938. Hinckley was sworn in August 8, 1938. Known as a man of action, it is not surprising that by November the Washington National Airport was begun. It was completed in June 1940. Mr. Hinckley became chairman of the Civil Aeronautics Authority in April 1939. A year later, he was appointed assistant secretary of commerce. In this position he was responsible for the direction of the Civil Aeronautics Administration, the United States Weather Bureau, and the Coast and Geodetic Survey. Undoubtedly Mr. Hinckley's most outstanding accomplishment during his service in the Civil Aeronautics Authority was the Civilian Pilot Training Program. This program, originally conceived by him as a peacetime project to give flight training to the youth of college age, proved to be one of the greatest contributions to the nation's war effort. The program was planned in 1938 and launched in 1939 with the passage by the Seventy-sixth Congress of the Civilian Pilot Training Act. At the time of the attack on Pearl Harbor, December 7, 1941 (less than three years since the inception of the Civilian Pilot Training Program), pilots were trained and airplanes were available for an all-out war effort. A favorite expression of Mr. Hinckley in reference to the growth of aviation was "air-condition". He thought the country should prepare for the air age he knew was sure to come. "Air-conditioning" to him was "conditioning people to the air, just as the people of the South Sea Islands are conditioned to the water, that other strange element to man." He said in his article "Air-Conditioning American Youth," Collier's Magazine (September 1942), "In short, to be air-conditioned means to be in a state of readiness to do something about aviation and not just feel strongly about it." He pursued his idea of "air-conditioning America" long after he left the CAA. Robert H. Hinckley resigned as assistant secretary of commerce in 1942. When Mr. Hinckley joined Sperry Corporation (Sperry Rand) after his resignation from the Commerce Department, it was in the belief that he would be undertaking work of great importance to war production, and that he would give up government service and remain in private business until his retirement. This belief was short-lived when, in 1944, President Franklin D. Roosevelt nominated him for Senate approval to be director of Contract Settlement for a term of two years. The settlement of government contracts was one of the most serious problems of the country's transition from war to peace. The Contract Settlement Act of 1944 stated that "It is the policy of the Government, and it shall be the responsibility of the contracting agencies and the director to provide war contractors with speedy and fair compensation for the termination of any war contract." It was hoped the policies established by the act would shift the United States economy from wartime to peacetime production with as little unemployment, waste, and other economic problems as possible. The organization was set up and functioning successfully when Mr. Hinckley resigned eighteen months later, February 1, 1946, to return to private life. President Harry S. Truman summed up his praise of Robert H. Hinckley's service in Contract Settlement as "A superior performance of a difficult task." Back in private life Robert Hinckley helped found the American Broadcasting Company with Edward J. Noble, long a close friend and colleague. Commercial television had become a reality, and it was in this exciting new medium, as well as radio, that Mr. Hinckley was to become involved. He was elected vice president and director of what was soon to become one of the major networks, merging in 1951 with Paramount Theatres, and extending throughout the United States. Further demands for Mr. Hinckley's talents in government service came from President Harry S. Truman, who appealed to him as a member of the Economic Cooperation Administration Public Advisory Board, to do a special inspection tour of European countries to determine the success of the Marshall Plan. Mr. Hinckley took a leave of absence in August 1949, from American Broadcasting - Paramount Theatres to complete the inspection. He continued to serve on the advisory board when the Economic Cooperation Administration was succeeded by the Mutual Security Agency. Robert H. Hinckley generously served state and national government, industry, educational institutions, and philanthropic causes during his lifetime. He was a member of many boards of directors. He served four terms on the University of Utah Board of Regents, serving until 1973. He established the Robert H. Hinckley Institute of Politics at the University of Utah on May 10, 1965, with a gift from himself and the Edward John Noble Foundation. On April 13, 1977, Robert H. Hinckley, eighty-five years of age, received the ninth annual Brotherhood Citation Award from the Utah Chapter, National Conference of Christians and Jews. The citation reads that Mr. Hinckley is honored for his "indelible impression of service to town and country as a state legislator, a mayor, a teacher, a national administrator, a presidential advisor, a giant of the business world, and as a benefactor of great universities." Robert H. Hinckley died in 1988 at his ranch in Eden, Utah. 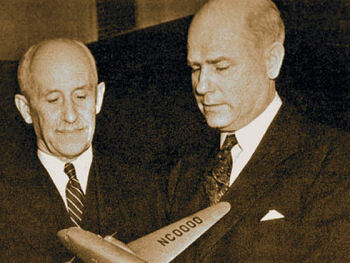 Robert H. Hinckley (right) with Orville Wright (left). Hinckley was the second chairman of the Civil Aviation Authority, and was the driving force behind the Civilian Pilot Training Program. Edward Noble & Robert H. Hinckley, Sr.
Broadcasting in the United States in the late 1920s was dominated by two companies, CBS and RCA's NBC, the first true radio networks. Prior to forming NBC in 1926, RCA had acquired AT&T's New York station WEAF (later WNBC). Along with WEAF came a loosely organized system that fed programming to other stations in the northeastern U.S. Prior to acquiring the WEAF group in mid-1926, RCA had previously owned a second such group, with WJZ in New York as the lead station (purchased in 1923 from Westinghouse). These were the foundations of RCA's two distinct programming services, the NBC "Red" and NBC "Blue" networks. The color designations apparently originated from the color of the push-pins early engineers used to designate affiliates of WEAF (red pins) and WJZ (blue pins). In 1940, the Federal Communications Commission issued a "Report on Chain Broadcasting." This report stated that two corporate owners (and the co-operatively owned Mutual Broadcasting System) dominated American broadcasting as a type of monopoly, and proposed "divorcement" requiring the sale by RCA of one of its chains. NBC Red was the larger radio network, carrying the leading entertainment and music programs. In addition, many Red affiliates were high-powered, clear-channel stations heard nationwide. NBC Blue offered most of the company's news and cultural programs, many of them "sustaining" or unsponsored. Among other findings, the FCC claimed that RCA used NBC Blue to suppress competition against NBC Red. The FCC did not regulate or license networks directly, but it could influence them by means of its hold over individual stations. Consequently, the FCC issued a ruling that "no license shall be issued to a standard broadcast station affiliated with a network which maintains more than one network." NBC protested that this indirect style of regulation was illegal, and appealed to the courts. However, the FCC won on appeal, and NBC was forced to sell one of its networks. It opted to sell NBC Blue. Throughout 1942 and 1943, NBC Red and NBC Blue divided their assets. A price of $8 million was put on the assets of the Blue group, and the Blue package was offered to potential buyers. Investment bank Dillon, Read made an offer of $7.5 million, but RCA chief David Sarnoff held firm at $8 million. After all, the Blue package contained leases on land-lines and on studio facilities in New York, Washington, D.C., Chicago and Los Angeles; contracts with talent and with about sixty affiliates; the trademark and "good will" associated with the Blue name; and licenses for three stations (WJZ in New York, San Francisco's KGO, and WENR in Chicago - really a half-station, since WENR shared time and a frequency with "Prairie Farmer" station WLS), with which it would later merge after World War II. RCA finally found a buyer in Edward Noble, owner of Life Savers candy and the Rexall drugstore chain. In order to complete the station-license transfer, Noble had to sell the New York radio station that he owned, WMCA. Also, FCC hearings were required. After considerable negotiation, the sale closed on October 12, 1943. The new network, known simply as "The Blue Network," was owned by the American Broadcasting System (ABS), a company Noble formed for the deal. During the early 1940's, Robert H. Hinckley was serving as a vice president of the Sperry Corporation, leaving to join Noble in his broadcasting ventures. Noble decided to rename The Blue Network the American Broadcasting Company. This set off a flurry of re-naming. To avoid confusion, CBS changed the call-letters of its New York flagship, WABC-AM 880, to WCBS-AM in 1946. In 1946, Hinckley and Edward Noble and Robert H. Hinckley co-founded the American Broadcasting Company (ABC), and over the next two decades they worked together helped to build this company into the major radio and television network that it became. ABC Radio began slowly; with few "hit" shows, it had to build an audience. ABC paid to acquire more stations, among them Detroit's WXYZ, one of the founding stations of the Mutual network. WXYZ was where The Lone Ranger, Sergeant Preston, Sky King and other popular daily serials originated. With this purchase, ABC instantly acquired a bloc of established daily shows. ABC also bought KECA (now KABC) in Los Angeles, to give the network a Hollywood production base. Counter-programming became an ABC specialty, for example, placing a raucous quiz-show like Stop the Music! against more thoughtful fare on NBC and CBS. Unlike the other networks, ABC pre-recorded many programs; advances in tape-recording brought back from conquered Germany meant that the audio quality of tape could not be distinguished from "live" broadcasts. As a result, several high-rated stars who wanted freedom from rigid schedules, among them Bing Crosby, moved to ABC. Though still rated fourth, by the late 1940s ABC had begun to close in on the better-established networks. Hinckley retired from ABC in 1959 as vice president of its Washington office, but he remained as a member of the ABC Board of Directors until 1969.